Jesus had a way of turning things on their head big time. We call ourselves his followers, but are we really willing to dare to follow his more difficult commands? ‘Let’s face it,’ says Steve Timmis. ‘Being a follower of Jesus can be rather inconvenient … a pain in the neck.’ It cuts right across so many of our ‘natural’ rights and desires. But the paradox is that it’s in the losing, rather than the loving, of our lives that we find amazing joy and deep fulfilment. Obeying God, rather than spoiling everything, enables us to live the life we were always made to live. I found this book compulsive reading - I couldn't put it down! The author, Steve Timmis, hits hard, but so truly and fairly - he kept reminding me of Jerry Bridges' book "Respectable Sins" and I felt convicted in every chapter, but also encouraged to accept the challenge to change - and be changed - to become what Jesus wants me to be. Thank you, Steve! Jesus certainly isn't convenient. All that stuff about denying self, loving enemies, being sacrificially generous, forgiving those who wound us and spreading the gospel across the globe can seriously get in the way of our comfortable lives! 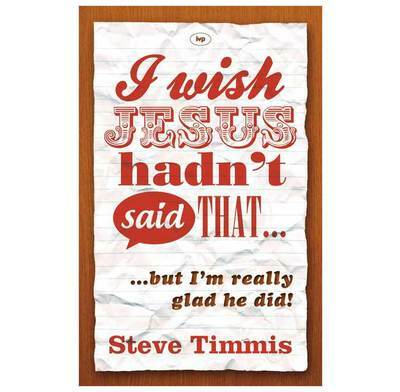 But in his easy-to-read book, Steve Timmis looks at 10 tough calls of Jesus and, in turn, humbly shows why the sacrifice they demand is totally worth it. With Bible passages simply explained and illustrations throughout that will simultaneously make you smile and think, this book is a great spur to faithfulness. It encouraged me to take stock of my life in light of Jesus' work, pray and reorientate my priorities - in so many ways! Go for it... This is not a book you will regret buying!